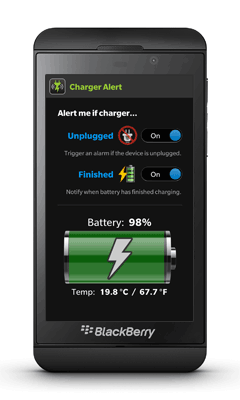 Charger Alert is now available for the BlackBerry Z10 at BlackBerry App World. Alarm if the BlackBerry Z10 is unplugged while connected to the charger. Alert to when the battery has finished charging. This entry was posted in News and tagged BlackBerry, Release by Charger Alert. Bookmark the permalink. © 2019 Charger Alert™. All Rights Reserved. Terms | Privacy.